KONG Ultra Squeakair Ball is suitable for dogs that like playing with a ball. 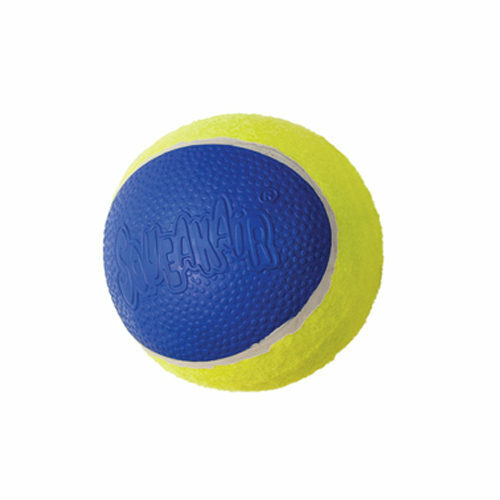 This durable ball with an internal squeaker is highly suitable for playing fetching games. Thanks to the unique texture of the ball, playing with it continues to be fun. The KONG Ultra Squeakair Ball is made of a durable material The ball is unique thanks to its smooth surface. This soft part of the tennis ball is very gentle on the teeth and gums. This makes it more fun for you and your dog to play with. For a playful effect, there is a squeaker inside of the durable ball. The KONG Ultra Squeakair Ball is a set that consists of 3 medium-sized balls. Have you used KONG Ultra Squeakair Ball before? Let us know what you think about this product. This is a great ball, as not only is it very robust, but the blue on it makes it easy to find in long grass (they say dogs can not see yellow balls as well as blue balls) and the squeak is an added treat - my dog and I love it!